Alphabet Alley is a company that provides preschool toys for children that are faith-based and provide positive messages. Their toys range from puzzles, to magnet playsets, games, wooden toys and stickers. I recently received several of their toys to review: Noah's Ark Go-Fish and Two by Two Matching Game (and there will be a giveaway of one at the end of this post!!). Playing matching games is a favorite in our house (and sadly one that my children can beat the pants off of me while playing). The Two by Two Matching Game ($10.99) is based on Noah's Ark and has 24 2x2 sized cards (perfect for little hands). The cards show rainbows on one side and simple animal picture on the other. The cards are amazingly sturdy and thick, much thicker than any of the other memory games we've played in the past. I love this version since there are 12 matches, making it a little simpler for younger players and a much quicker pick-up too when the the game is done! 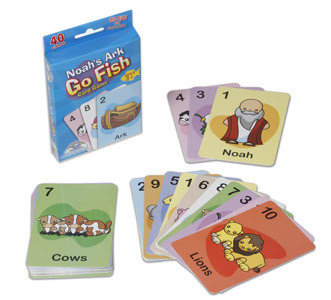 The Noah's Ark Go Fish game ($5.99) is just like other Go Fish games - but even better! The cards are much sturdier and the have a better "feel" in your hand. Each card has a number, a large picture of a Noah's Ark themed item, and the word describing the picture at the bottom. This game hasn't been played yet in our house because it is now hiding in our Christmas pile downstairs for two little boys in this house - I love it! Just in time for Christmas, Alphabet Alley is having a sale on any toy that is Christmas related. Their games and toys would make some great stocking stuffers this Christmas! 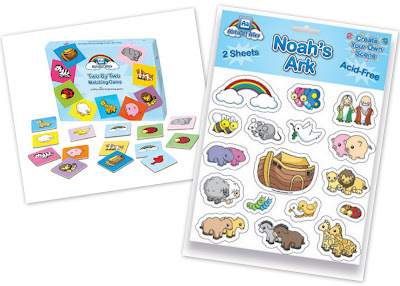 If you are interested in winning the Two by Two Matching Game and a set of the Noah's Ark Stickers for a little person in your house, leave a comment on this post (be sure that I can get ahold of you if you win!). I will pick a winner on Monday, December 8th. Don't forget to check out other great WFMW ideas! Oh, me! Me! Pick me! Too cute. I'm heading over to their website too to check out their other products. These look great! I grew up loving matching games, and so if my little one is anything like me she'll love it! These look great! My Girlie will be ready for things like this soon, so I'd love to win! Oh wow! I'll have to look into those for last minute gifties! Of course FREE gifties would be nice too...wink wink nod nod. I love games that teach kids without their knowing it! Thick cards would be great, my little boy crumples up the thin, cheap ones within a couple of uses. Those stickers are adorable-- hope I win! What a great prize! J loves matching and the story of Noah is one of her favorites. Thanks! What an awesome prize. As a former teacher, now SAHM, my little girl loves to sit with me and play 'school.' This would be a great stocking stuffer. Thanks for the opportunity to win. One of my little people LOVES to match these days; I'd love to win! My little girl loves games, she would love these. Thanks for the chance. My daughter loves card games! These look really nice and I love that you mentioned how sturdy they are - this is a must with toddlers! Wow, These look soo neat! My daughter just turned 18 months today! She is always facinated when my husband and I play cards. We had to get her her own deck. These would really help with teaching her so many concepts though! She is facinated with animals and she is learning names/signs for all sorts of things! My best friend's son needs these!! He's really interested in everything we're doing and I think it would be fun to play with these with him! I don't know if I'm too late to enter the giveaway, but even if I am, thanks for showing me these! They'll be great for my kids and I think one would make a great gift for my sister's kids!